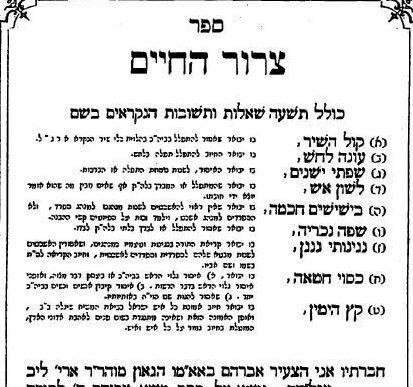 The oaths and the concept surrounding them are explained beautifully in a book called Tzeror Hachaim, written by Rabbi Avrohom Loewenstamm of Emden in 1820. The book is actually a polemic work against the Reform movement, which was becoming prevalent in Germany at that time. The book contains discourses against organ music in the synagogue, prayer in German, going bareheaded and other innovations of the Reform movement. The last chapter is entitled Ketz Hayamin, and discusses our belief in the coming of moshiach. The Reform movement had produced new prayerbooks, omitting all reference to Eretz Yisroel, Jerusalem, the redemption or moshiach. They argued that such subjects inherently contradict the concept of patriotism and loyalty to one’s land and government. How could Jews claim to be “Germans of the Mosaic faith” if their longing was to rise up from exile and go back to their homeland? The Reformers even published books (for example, a pamphlet called Nogah Hatzedek, published in Dessau in 1818) arguing that this was Chazal’s outlook. Didn’t Chazal prohibit us from forcing the end of exile, which, according to Rashi in Kesubos 111a, means praying too much for the redemption? In response to this, Rabbi Avrohom Loewenstamm quotes numerous verses, Chazal and stories to prove that there is no contradiction between our longing for Jerusalem and our loyalty to our exilic host countries. This is because the redemption will come about only through G-d and His emissary, moshiach; we are forbidden to make any efforts on our own. 1. During their Egyptian slavery, the Jews lived in concentrated areas and could have organized themselves to rebel against their masters. They were capable warriors, as we see from their later victories over Amalek, Sichon, Og and the Canaanites. Yet they accepted their exile willingly. 2. During the Babylonian exile, and continuing under the Median and Persian empires, the Jews never had any thought of rebelling and returning to their land by force. Indeed, the prophet Zechariah (4:6) declared, "Not by might and not by power, but by My spirit, said Hashem Tzevaos." 3. When Haman's decree was overturned, the Jews carried out an attack on their enemies throughout Achashverosh's empire, killing 75,000 of them. Seemingly this proves that it is allowed to organize ourselves in self-defense during exile. But, writes Rabbi Loewenstamm, it is actually proof to the contrary. When the king gave Mordechai his royal seal and told him to "write whatever is good in your eyes regarding the Jews," he also cautioned him that "a decree that is written in the name of the king and and stamped with the king's seal cannot be revoked" (Esther 8:8). Knowing that he could not revoke the decree of Haman, Mordechai instead wrote that "the king gives the right to the Jews in every city to gather and defend themselves" (8:11). Upon the issuing of Mordechai's decree, the Jews rejoiced (8:16-17). What was there to rejoice about? The Jews were a small minority and didn't stand a chance against the non-Jews of the empire. The answer is that the Jewish people had a long history of beating nations more mighty and numerous than they - when they repented and Hashem was on their side. Therefore they trusted in Hashem to help them in this war as well, which He did. If so, why did they need Mordechai's decree at all? Because without it, they would have been forbidden under the oath from rebelling against the king's decree. They would have had no right to rely on a miracle and fight back. Therefore, prior to Mordechai's decree, they used only the power of their mouths - prayer, fasting and repentance. 4. According to Roman historians, the Jews of Alexandria rebelled against Rome and were crushed by the emperor Trajan, who killed 200,000 of them. Rabbi Loewenstamm responds that according to Jewish sources (Esther Rabbah, Pesicha 3) the destruction of the Alexandrian Jewish community was unprovoked, and resulted from the accusation that the Jews were celebrating the death of the emperor's baby by lighting candles on Chanukah. The answer is, he says, that the city of Beitar, in which Bar Kochba reigned for two and a half years, had never been conquered by Rome at all. Beitar was a living remnant of the Jewish kingdom that had existed before the destruction of the Temple. Evidence to this can be found in the words of the Midrash Eichah (2:2): “Fifty-two years Beitar lasted after the destruction of the Temple. And why was it destroyed? Because they lit candles to celebrate the destruction of the Temple.” The Midrash goes on to explain that they rejoiced that Jerusalem was gone, and now Beitar would be the commercial center of the Land. Thus, Beitar had been a Jewish center all along, and Bar Kochba’s reigning in Beitar was not really an act of revolt against Rome. Rabbi Akiva was completely justified in supporting this, and he never, G-d forbid, entertained thoughts of rebellion.